FIRO is a proposed management strategy that uses data from watershed monitoring and modern weather and water forecasting to help water managers selectively retain or release water from reservoirs in a manner that reflects current and forecasted conditions. FIRO is being developed and tested as a collaborative effort focused on Lake Mendocino that engages experts in civil engineering, hydrology, meteorology, biology, economics and climate from several federal, state and local agencies, universities and others. Photo of Lake Mendocino FIRO Working Group. August 2014. Shown in photo: 1) Mike Anderson (CA DWR), 2) Mike Dillabough (USACE San Francisco District), 3) Levi Brekke (US Bureau of Reclamation), 4) Rob Cifelli (NOAA/OAR/PSD), 5) Robin Webb (NOAA/OAR/PSD), 6) Don Seymour (SCWA), 7) John Helly (UCSD/SDSC, CW3E), 8) Chris Delaney (SCWA), 9) Sean White (RRFC), 10) Lorrie Flint (USGS CA-WSC), 11) Stu Townsley (USACE South Pacific Div), 12) Alan Flint (USGS CA-WSC), 13) Mike Dettinger (USGS, Scripps, CW3E), 14) Allen White (NOAA/OAR/PSD), 15) Steve Lindley (NOAA/NMFS/ SWFSC), 16) Cisco Werner (NOAA/NMFS/SWFSC), 17) Lynn Johnson (NOAA/OAR/PSD), 18) Matt Fleming (USACE/HEC), 19) Chandra Pathak (USACE/HQ HHC), 20) Deb Curry (USGS CA-WSC), 21) Natallie Manning (NMFS/Restoration), 22) Christy Jones (USACE Sacramento District), 23) Cuong Ly (USACE South Pacific Div), 24) Ron Hartman (NOAA/NWS/CNRFC), 25) Marty Ralph (UCSD/ Scripps/CW3E), 26) Arleen O’Donnell (ERG), 27) Jay Jasperse (SCWA), 28) Josh Fuller (NMFS/Restoration). Not in picture: Ann DuBay (SCWA), Dan Cayan (Scripps/USGS/CW3E), Sasha Gershunov (Scripps/CW3E). 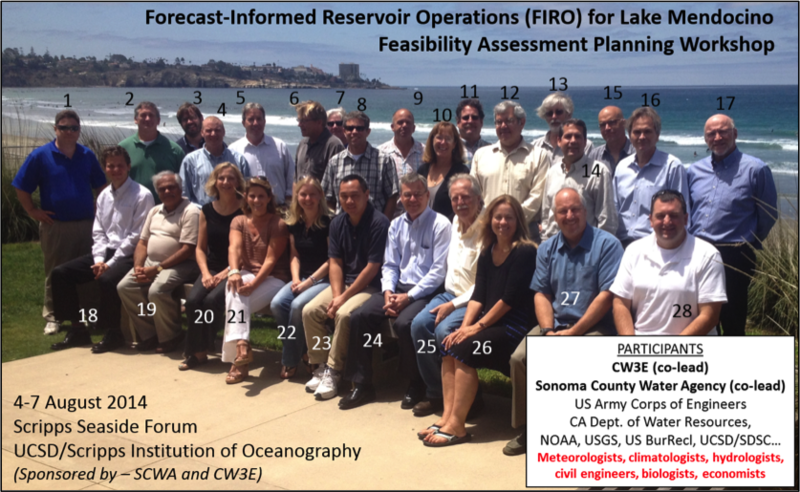 The FIRO Steering Committee, a multi-agency team, comprised of water managers (flood, water supply, and fisheries) and scientists (hydrology, weather/climate, modeling) has been formed to undertake this evaluation (see list of FIRO Steering Committee members to the left). This team represents a collaboration among local, state, and federal agencies and could serve as a model for similar efforts for other facilities. It will be critical that the project team continue to coordinate across their respective organizations during the demonstration study and subsequent activities. This effort includes procuring funding for projects identified in the demonstration study. Under the umbrella of the Integrated Water Resources Science and Services (IWRSS), a collaborative effort between NOAA, USACE and USGS, the FIRO Steering Committee is working with a larger working group to broaden input on and participation in the preliminary viability assessment to determine if FIRO can improve water supply, flood control and ecosystem benefits at Lake Mendocino. The interests of each of the primary agencies are described below. Sonoma Water is motivated by the possibility of more water available for water supply – especially in dry years when lake levels are extremely low. The Water Agency has been working actively with many of the FIRO partners for several years on a variety of projects, and is also interested in furthering transfer of science-based information to systems nationwide that face similar challenges. The United States Army Corps of Engineers (USACE) is motivated by the possibility of updating a rule curve that was developed in the 1950s (with some modifications in the 1980s) that no longer accurately reflects current conditions. In addition, better forecasting could provide the USACE critical information during large storms, possibly allowing greater flexibility to drop water levels below the rule curve to help prepare for imminent flood events. The Center for Western Weather and Water Extremes (CW3E), is a non-governmental organization (NGO) at UC San Diego’s Scripps Institution of Oceanography. CW3E provides 21st Century water cycle science, technology and outreach to support policies and practices that address the impacts of extreme weather and water events on the environment, people and the economy of Western North America. CW3E brings deep expertise on atmospheric rivers that are key to Russian River water supply and flooding. National Atmospheric and Oceanic Administration (NOAA) has several interests: the Russian River Watershed is designated as a Habitat Focus Area under NOAA’s Habitat Blueprint; its National Marine Fisheries Service (NMFS) is deeply involved in the recovery of three species that depend on the Russian River, endangered coho salmon, threatened Chinook salmon and steelhead trout; and NOAA’s Office of Atmospheric Research (OAR), and the California-Nevada Rivers Forecast Center (CNRFC) are directly involved in forecasting improvements in the region. US Geological Survey (USGS) has been involved in hydrologic monitoring and research for over a decade in the Russian River watershed, including stream gage monitoring, development of soil moisture monitoring methods and integrated modeling of rainfall-runoff, soil moisture, and surface/ground water flow. The Corps and the Bureau of Reclamation (BOR) are cooperating on a similar project near Sacramento, CA (at Folsom Lake) and is interested in sharing information and processes. State and regional stakeholders are also involved, including the California Department of Water Resources (DWR), which has worked closely in the watershed on several projects. The Mendocino County Russian River Flood Control and Water Conservation Improvement District (Mendocino Flood Control District) also has rights to Lake Mendocino water, and helps represents the interests of other, smaller water districts and communities that depend on the lake for water supply. Many of these agencies already work together on projects in the watershed that are focused on developing better data and information sharing, including the Habitat Blueprint, the National Integrated Drought Information System (NIDIS) and NOAA’s Hydrometeorology Testbed (HMT).